How are BIO BLOCKS made? BIO BLOCKS are made of 100% recycled, kiln-dried hardwood sawdust compacted together under high pressure to form a wood briquette. Wood contains lignin, a natural binder under pressure, which means that no additives or chemicals are necessary. 5 of 5 found this answer helpful. page and enter your zip code to find the retail store closest to your home. We do not sell directly from the plant. 5 of 7 found this answer helpful. What are the benefits of heating my house with BIO BLOCKS? A Lifestyle Choice – Spend more time with your family, instead of using your evenings and weekends to chop firewood. Store Inside – An added bonus when the cold winter wind blows and the snow gets deep. Saves Time – Spend less time cleaning ashes or chopping, splitting and stacking firewood. Economical – One ton of BIO BLOCKS is equivalent to the BTU’s of one and half cords of firewood. Easy to Handle – The size of BIO BLOCKS is easy for anyone to handle from young to elderly parents. Minimal Smoke – You will have happy neighbors by not covering their homes with smoke. Saves Space – One 40″ x 48″ x 36″ pallet of BIO BLOCKS takes less space than a 4′ x 4′ x 8′ cord of firewood. Easy to Stack – If preferred; packs can be removed from the pallet and stacked against a wall. Packs are flat and uniform in size, making it easier to stack than firewood. Convenient – Some stores will deliver a pallet to your home. What does the SWI imprinted on the side of a BIO BLOCK stand for? SWI stands for Summit Wood Industries which is the name of our company. 7 of 7 found this answer helpful. How do I store BIO BLOCKS? BIO BLOCKS must be stored in a dry location. The packs are 11″ wide x 12″ long. Because it is flat pack and uniform in size, BIO BLOCKS are easier to stack and store than logs. Pallets are 40″ wide x 48″ deep x 36″ high. One ton takes less space to store then a 4′ x 4′ x 8′ stack of cordwood. Why should I switch to BIO BLOCKS? Fuel oil and natural gas are very susceptible to market conditions, especially in this economy. Cordwood contains high moisture, making its BTUs unpredictable when burned. BIO BLOCKS are a clean, cost-effective alternative to other heating sources. BIO BLOCKS are not dependent upon foreign sources; it is a 100% domestic product. BIO BLOCKS also are carbon neutral, making it a family-safe product. BIO BLOCKS have a predictable manufacturing process; therefore, the BTUs are consistent in every BIO BLOCK. 3 of 4 found this answer helpful. Are BIO BLOCKS environmentally responsible? Yes. BIO BLOCKS are a natural, carbon neutral, energy efficient product. BIO BLOCKS are made from kiln-dried hardwood sawdust. Our contracts with local companies for their by-product keeps it from going to landfills. No trees are harvested. Made from 100% recycled wood. BIO BLOCKS burn clean. When you only burn BIO BLOCKS, you’ll notice a minimal amount of smoke, creosote and ash. You’ll be a good neighbor by not covering the neighborhood with smoke! Carbon neutral means that when wood briquettes are burned, it emits the same amount of carbon that was produced by the trees that it came from. Do I have to buy a special stove or wood-burning device to burn BIO BLOCKS? No. Unlike wood pellets, which require a special pellet stove, BIO BLOCKS offer versatility and can be used in your existing wood stove or any wood-burning device. Can I have BIO BLOCKS delivered to my home? Check with your local retail store to see if they offer home delivery. Many stores offer free delivery or will deliver for a nominal charge. 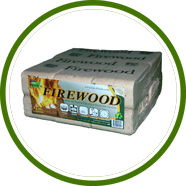 BIO BLOCK Firewood is manufactured by Summit Wood Industries, Inc. Our business is located in Orrville, Ohio, U.S.A.
Where can I buy BIO BLOCKS? Go to our Where to Buy page and enter your zip code to find a store near you. If you cannot find a store in your area, contact us for assistance. Note: We are wholesale only. We do not offer retail sales from the manufacturing plant. Can BIO BLOCKS be transported across state and county lines? BIO BLOCKS are made of kiln-dried hardwood sawdust. The sawdust, which is an off fall product from lumber that is being processed at manufacturing plants, has gone through the drying process. Kiln-drying wood kills all bugs and bacteria. For this reason, BIO BLOCKS can be transported across county and state lines, and into state parks, without concern of spreading invasive insects like the Emerald Ash Borer. It is an economical, eco-friendly option to traditional camp firewood. Can I burn BIO BLOCKS with traditional firewood? Yes, BIO BLOCKS and firewood can be burned together, although it will eliminate some of the advantages of burning only BIO BLOCKS. 8 of 12 found this answer helpful. Interested in learning more about BIO BLOCK visit the product page! Can I use BIO BLOCKS instead of charcoal for cooking with my Dutch Oven? BIO BLOCKS can be used for Dutch Oven Cooking. We recommend starting with 10 BIO BLOCKS so you have plenty of hot coals. Start your fire 1 1/2 hours before you plan to cook, allowing the BIO BLOCKS to burn down. A 12″ Dutch Oven fits perfectly in the BIO BLOCK Portable Fire Pit. Remove some of the coals, place your Dutch Oven in the fire pit, and place the coals that were removed on the lid of your oven as you would with charcoal. Keep in mind, however, that BIO BLOCKS burn very hot, so you will need to reduce the cooking time. Because of the even output of heat, we do not turn our Dutch Oven when cooking. Check your food often for best results. Can I Burn Firewood in the Portable BIO BLOCK Fire Pit? Although the fire pit was designed to burn BIO BLOCKS, firewood can be used alone, or mixed with BIO BLOCKS to create a cozy campfire. How long does one BIO BLOCK burn? We do not reccommend trying to burn one block because there is not enough surface area to establish a good fire. BIO BLOCKS should be arranged in a group, as you would a tradtional wood fire. The BIO BLOCK Portable Fire Pit is designed to hold 8 BIO BLOCKS. This provides 1 ½ to 2 hours of flame and 2 hours more of heat from hot coals. If you are not cooking, but plan on sitting around a fire, add additional BIO BLOCKS as needed to maintain a flame. Burn time will vary, with an outside fire, depending on draft and climate conditions. Are BIO BLOCKS safe to cook over? BIO BLOCKS are safe to cook over because no glue or additives are added to BIO BLOCKS. We recommend starting your fire 1 – 1 1/2 hours before you plan to cook to allow the fire to burn down to hot coals. BIO BLOCKS can be used as an alternative to charcoal. If cooking with a Dutch Oven, start your fire with 10 BIO BLOCKS, instead of 8, to allow for plenty of hot coals. 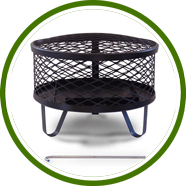 Interested in learning more about the PORTABLE BIO-BLOCK FIREPIT, visit the product page! The moisture content of BIO BLOCKS is 8.5% according to a study at the University of Buffalo, compared to firewood that is considered seasoned at 20%. Fuel oil and natural gas are susceptible to market conditions. BIO BLOCKS are environmentally friendly using renewable resources. Made in the U.S.A. which keeps jobs here and lessens our dependence on foreign oil. BIO BLOCK® are easy to stack, taking less space than a cord of wood. Our pallet size is 40” x 48” x 36″. Uniform size, density and moisture ensures predictable burning each time. During power outages, BIO BLOCKS still provide heat. Less smoke, ash and creosote = less time maintaining your stove and chimney. Reclaim your weekends! No more time splitting and chopping firewood! Efficient warmth. 1 ton of BIO BLOCKS® is equivalent to 1½ cords of wood. 100% Recycled product. No trees are harvested to create this product. Clean! Bugs and dirt are not brought into your house.